As a wildlife artist, one of my goals was to get to Etosha National Park in Namibia. It’s one of the most amazing places in the world and I managed to visit it last year. I broke my record for seeing the most number of elephants in one line of vision ever, thirty-three. 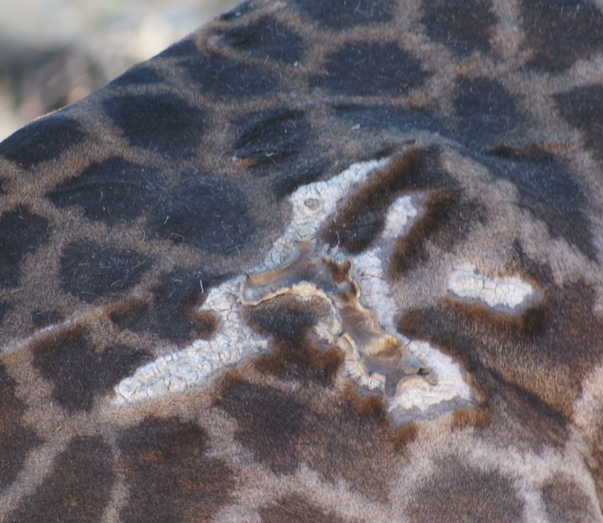 I also saw a giraffe with a huge lion claw mark on its rump where it had escaped the clutches of a lion. Of course I also saw just about every other animal under the sun too (excluding buffalo, hippo and crocs as the climate and subsequent lack of water doesn’t allow for them). The town of Etosha is close by and there’s a group of Himba women who hang around trying to make money from tourists by getting them to take their pictures. Of course, they are all so amazing looking that you can’t help but pay up and click away. I negotiated hard with the girl who seemed to be designated to handle the financial transactions. She was about 16 years old and quite the negotiator. I thought I did well but when I handed over the small amount of money (in western terms) she insisted I took a photo of her holding the money up. I think they were quite pleased with the amount, and this was confirmed when another one took my hand and wouldn’t stop kissing it. Of course, I made good use and snapped away for quite a while getting a very good selection of photographs. And I’ll bet not many South Australians can say that their hands have been kissed by Himba maidens!! 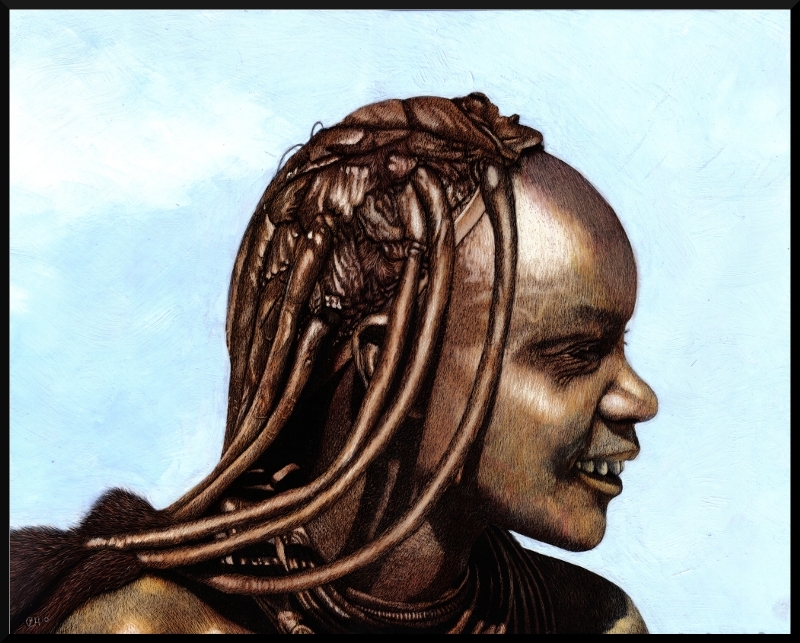 So what’s so special about the Himba? Well, they never bathe. 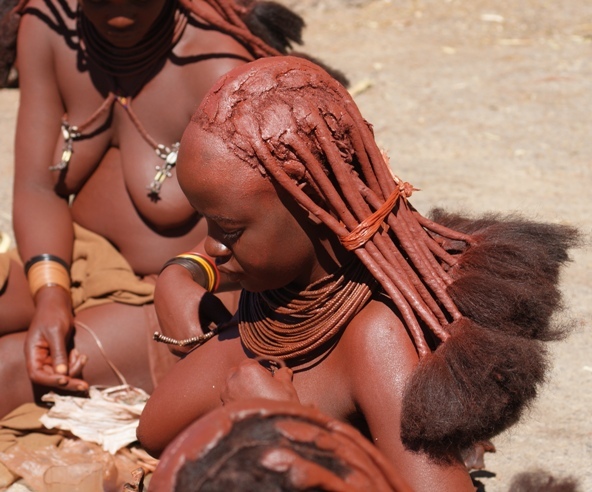 They cover their bodies with a mixture of fat, red ochre mud and the resin of the Omuzumba shrub , and they also pack this mud on and in their hair. The resulting red colour symbolises their connection with the earth and also blood of new life. The added benefit is that they are more protected from a very hot sun. The women don’t wear clothing from the waist up (neither do them men) and this coupled with the red colour makes them quite a sight and an obvious target for an artist. 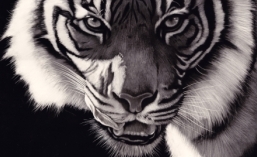 This is a scratchboard I did of one of them, coloured with inks, coloured pencils and oil paints. Hey, nice site you got here! Keep up the good work!